American rabbi of English Sephardic descent; born in Kingston, Jamaica, Sept. 24, 1834; died in Philadelphia July 14, 1884. He went to the United States in 1854 and settled in Richmond, Va., frequently officiating for the Congregation Beth Shalome, studying meanwhile for the ministry; in 1857 he was elected to the rabbinate. In 1869 he succeeded Isaac Leeser as rabbi of the Congregation Beth El Emeth in Philadelphia. He was connected with many Jewish and other lodges, and was one of the founders of the Young Men's Hebrew Association of Philadelphia, of the Board of Jewish Ministers of Philadelphia, and of the American Jewish Publication Society. He was a contributor to the Philadelphia Jewish press, published several catechisms, and aided in the revision of the English of the Szold-Jastrow Prayer-Book. 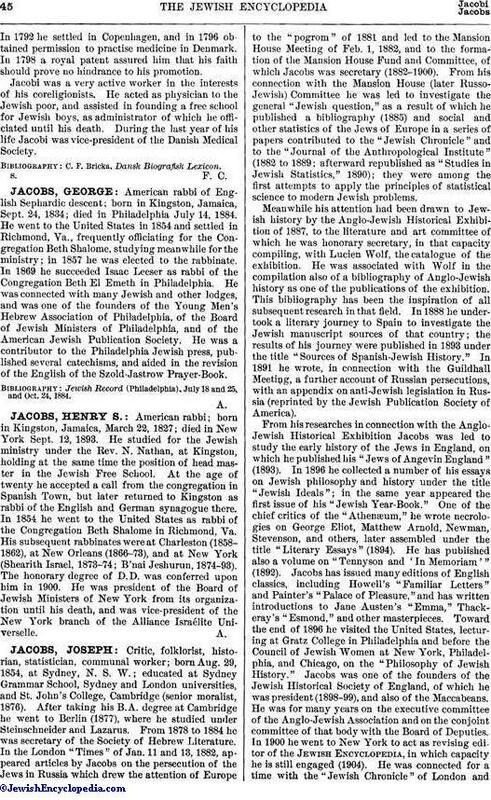 Jewish Record (Philadelphia), July 18 and 25, and Oct. 24, 1884.